Donatella Versace asked perfumer Alberto Morillas to make Versace’s new men’s fragrance simple and “precise” and she seemed pleased with the result and said: "When I smell the scent, it reminds me of my father because my father wore neroli.," (Women's Wear Daily, 1/18/08). That’s all well and good, but Ms. Versace took her fragrance brief a step further and asked that the scent “suit a self assured and, above all, attractive man." (Cosmetics International, 3/21/08) I’m definitely cute enough to wear this, but other guys out there may want to consider having their hair cut, shaving, getting a facial and back wax, etc., before venturing to buy Versace Pour Homme. Versace Pour Homme contains bergamot, bitter orange leaves, neroli, diamante citron, geranium, clary sage, blue hyacinth, cedar wood, oud, mineral amber, musk and tonka bean. Versace Pour Homme opens with tart, talc-y citrus and a “water”/marine note. I was about to let out a sigh of boredom when a natural-smelling candied citrus note appeared — and lasted a good while. This pleasant citrus note (I’m telling myself it’s diamante citron whether that’s true or not) reminds me of the delicious lemon note in Chanel Allure Homme Édition Blanche. Unfortunately, Versace Pour Homme proceeds to predictable light musk territory, and in the end, one good note can’t save a fragrance. Many Now Smell This readers have seen the picture of Donatella Versace surrounded by hundreds of bottles of her personal perfumes and I don’t understand why she wanted a sport fragrance (even with better quality ingredients than most) to stand for the Versace “man”/brand. Surely, she’s smelled her fair share of men’s colognes and realizes Versace Pour Homme is conventional? Anyway, Versace Pour Homme is expected to earn $100 million in its first year of release — so an easily understood fragrance has its advantages in the marketplace (and in filling Versace’s bank account). Calvin Klein’s ‘original’ Euphora Men is a pleasant cologne that opens with spicy citrus, a hint of sage, and proceeds to a long-lasting melon (raindrop) section and ends with a rather ordinary light-woods-mixed-with-“suede” base. I don’t dislike it, but I’ve never felt the need to own it. Now comes Intense Euphoria Men; it contains many of the same notes as original Euphoria Men — ginger-pepper cocktail, chilled sudachi, raindrop accord, black basil, cedar leaf, sage, patchouli, and amber — but Intense Euphora Men adds labdanum, vetiver, oud wood and myrrh to the mix and deletes original Euphora Men’s redwood and suede notes. 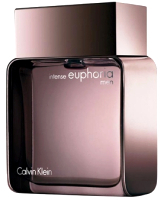 Intense Euphoria Men (created by perfumers Carlos Benaïm and Loc Dong) goes on skin smelling like sweet cough syrup, or fruity sore throat lozenges; I do not like the medicinal edge at all, or the intense sweetness. After the cold medicine burns off, I get lots of “raindrops” — an accord that reminds me of the honeydew melon-flavored hard candies I buy at a local Japanese market. Intense Euphoria Men suffers from a new malady affecting many men’s and unisex fragrances of the last year: melonitis. The melon in Intense Euphoria Men, once it’s on skin, comes “alive” and starts breeding, producing hours of melon overload. About two hours after I put on Intense Euphoria Men I detected light oud and a “balmy” wood note, but it was too little, too late (and the melon was still intruding). Though the Rocawear clothing company has been around for almost 10 years, until I received a sample of Rocawear 9 IX, I had never heard of Rocawear! I went to the Rocawear website and quickly realized I am not a Rocawear “type” — I don’t eat 10 calorie Jell-O for dessert and run an hour each day in order to be covered up in Rocawear’s billowing, oversized shirts and pants. Give me Thom Browne-wear instead. Does the world need more sport fragrances or melonitis-afflicted scents? NO. After a few weeks of wearing and then reviewing six new middle-of-the-road fragrances (see Gucci by Gucci Pour Homme, Hilfiger by Tommy Hilfiger & Emporio Armani Diamonds for Men), I need to wear something wondrous, unusual. Has anyone smelled something released in the last few months that is truly interesting and that won’t remind me of candy or teen boys drenched in sport colognes? If so, please comment! All today’s fragrances are available in Eau de Toilette: Versace Pour Homme, $55-72; Rocawear 9 IX, $35-65 (available in 30 ml size); and Calvin Klein Intense Euphoria Men, $50-65.